Since the creation of the school Heiho Niten Ichi Ryu, « School of strategy of two Heavens as One »or 2 swords as one by Miyamoto Musashi (1584-1645), one of the greatest Samourai and never been defeated in 60 duels , passed his knowledge and his battle field experience on to us. Koryukan is proud to be on the path of the Great Master. After many journeys to Japan seeking for continuous improvement, Medhat Darwish Sensei, Shihan in Daito Ryu Aikibudo, is now a holder of a teaching Mokuroku in Hosokawake Dento Heiho Niten Ichi Ryu. 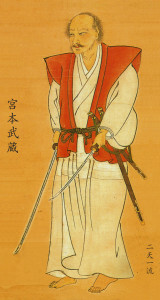 The goal of Koryukan is to maintain and to spread the teaching of NitenIchiRyu, the use of two swords.